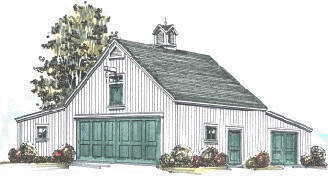 This versatile backyard barn is a two-car garage with an extension at back for your tractor, tools and workshop. There's a 10' x 24' shed at the side and Loft for even more storage. Floor Area: 1,104 Sq. Ft., Loft Area: 576 Sq.Ft.